A couple of days back I had cause to visit Gayana Samaja at KR Road. The occasion was Nagaswara performance by Chinnamanur A Vijay Karthikeyan and Idumbavanam V Prakash Illayaraja. The refurbished building of 1962, one of the oldest cultural institutions is located at a rather desolate place. 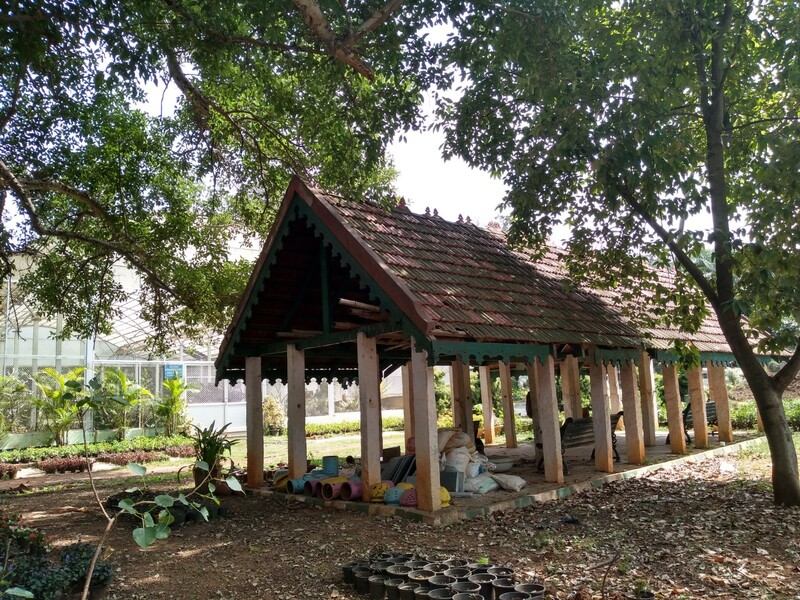 Located next to the Theosophical Society, the stretch of road connecting Gayana Samaja from KR Road was lined with many basket weavers- making and selling their wares. Perhaps because of white topping work going on for the road-it gave an impression of being deserted and vacant. However appearances are deceptive as I was to discover later. The institution that is more than 110 years has been promoting classical music,dance,theater since 1905. However this site was not its present location. 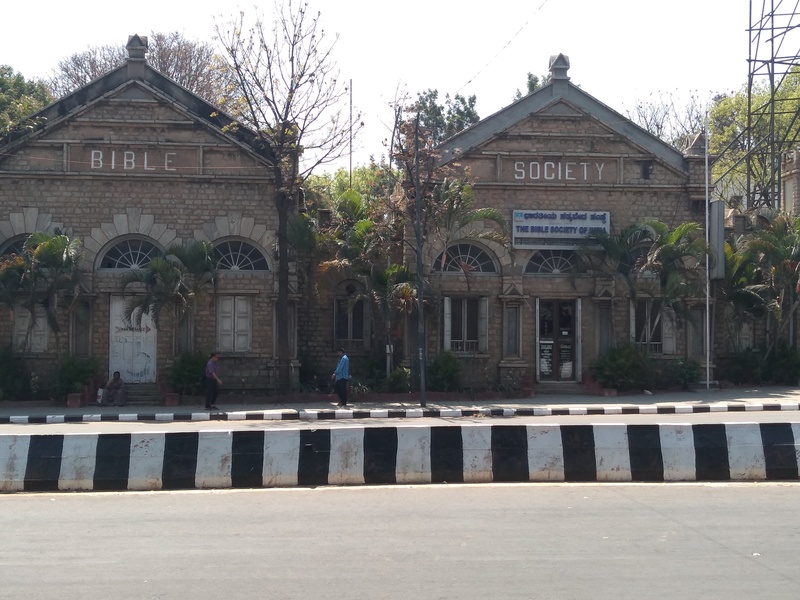 One of the founder of this institution was K Ramachandra Rao-the Head Master of London Mission High School-Bangalore and in its initial years the hall of London Mission school was used to hold concerts. 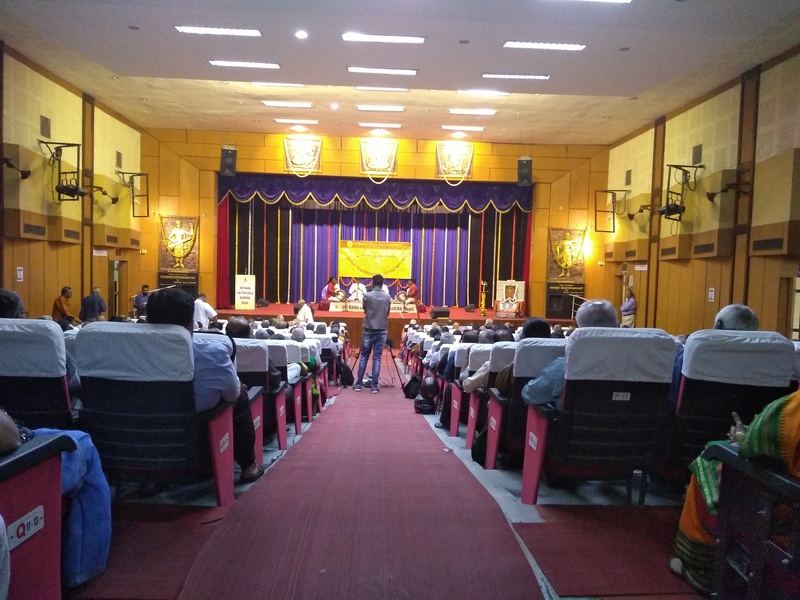 Sometimes the events were held at Ekambara sahuji hall, Chikpete. 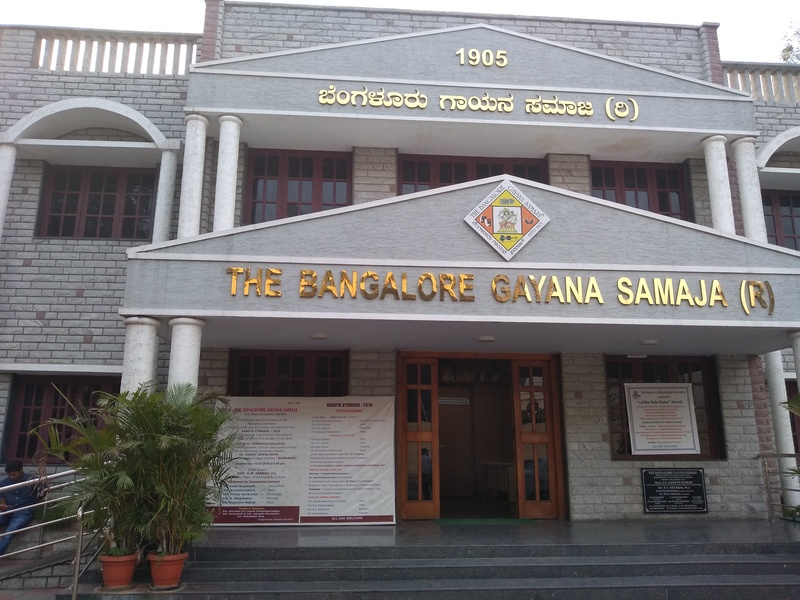 It then shifted to old Sanskrit college building, then to Shankaraiah hall when the Sanskrit college gave way to Vani Vilas Hospital and finally in 1962 with funds from Centre,State,donations- the present site was selected as the venue for Gayana Samaja. The construction cost came around 2,60000, out of which 40,000 was derived from MS Subbalakshmi’s benefit concert. As you enter inside, you will see pictures of yesteryear stalwarts lining the wall. 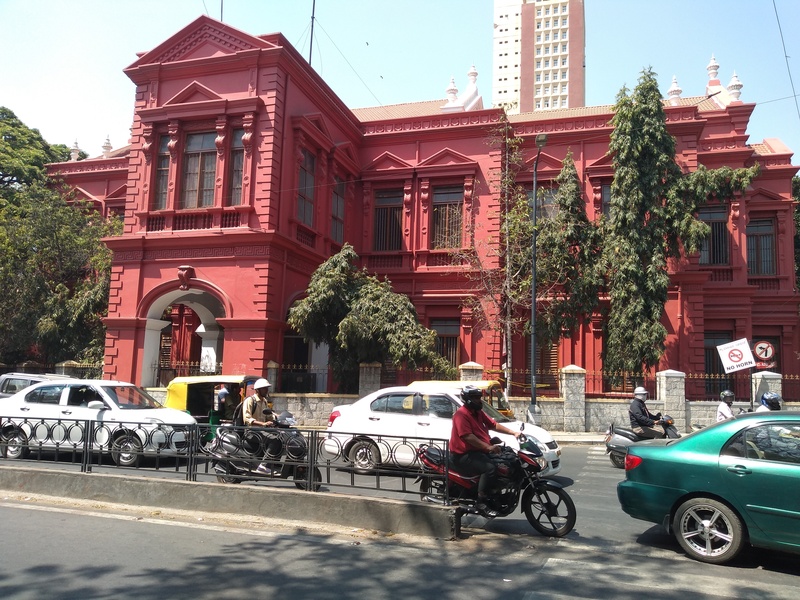 Some of the prominent ones being Sri Jayachamaraja Wodeyar- earlier patrons of Samaja, musicians and singers like Doraiswamy Iyengar,MS Subbalakshmi, T. Chowdiah,Diwan of Mysore, founder members and former presidents.In 2016,this building was renovated again;the columns and beams of the old building still being retained. The 700 seater auditorium has improved acoustics, Led lighting and its new roofs are said to bring down the temperature inside the room by 2 degrees. When I went inside, the auditorium was jam packed,abuzz with activity in sharp contrast to the street outside. The concerts were in full swing and after the concert some 62 cultural institutions in the State were recognized and awarded with cash prizes. There is a host of activities in the following months- award functions,vocal concerts and lecture demonstrations. The institution does not stick to Carnatic and Hindusthani music alone. Light music,folk,theater,dance are also given sufficient encouragement. Most of these activities are live streamed at their FB Page- shaaledotcom. In the initial years when the concerts had started out they were no mikes and were dependent on the acoustic properties of the room. In-fact the tiled roof of Sanskrit college provided the perfect acoustic environment. And there was also a screen like a ‘purdah’ in the Sanskrit college hall to seat the ladies who had come to watch the performance. Interesting isn’t it?The fact that a 115 year old cultural institution promoting classical music has stood its ground in the city alongside Western music, pop groups and VJ’s says something about the openness in our culture and love for music. 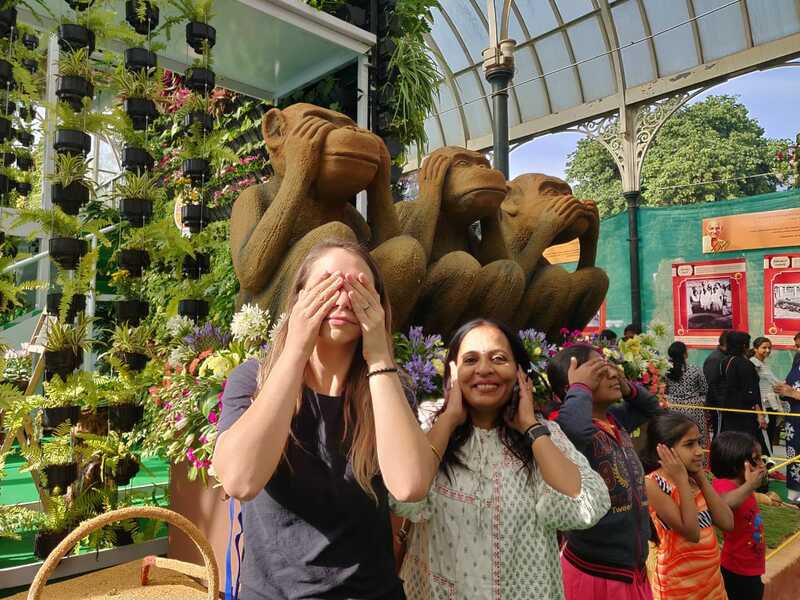 For more such amazing insights of the city join our Unhurried Heritage and Food Walks. M.G.Road is one of the busiest roads in the city of Bengaluru and is one of the most happening places too. Shopping malls, pubs,restaurants,art galleries, showrooms, banks dot this lively stretch. It is hard to believe that it was once a general parade ground with its barracks and regiments and from where the military and civil station burgeoned. But look closely. And you will still see remainders of the by-gone era in the hidden houses tucked behind buildings,in the plaques of churches,in the signboards and statues….. Here are few fleeting glimpses of the station it once was. At the east end of M.G.Road stands the Holy Trinity Church. It was one of the second churches in the area-the first was St Mark’s Cathedral. This century old church built in 1852 for the British Regiment has a number of tablets dedicated to officers who died in various battles of South East Asia. There are tablets mentioning about officers of Mysore Revenue survey-there is one that talks about a officer who died from tiger wounds at shimoga; the 4th Hussars[Queen’s Own], King’s Dragoon Guards, Royal Artillery etc. Men who died at sea on their way to England,or of cholera on their march towards Bangalore finds mention here. Most of these are dated before 1880’s and gives a glimpse of society back then. During the summer of 1914, the Station had several troops-the 7th Hussars,the 26th Light Cavalry, the 13th Brigade R.F.A, 2nd and 44th Batteries,R.F.A,the 108th infantry etc. As you make your way out of the Church you catch sight of Mayo Hall- another colonial building dedicated to Lord Mayo,Viceroy of India. It was used as municipal offices,the upper floor was meant for public meetings. 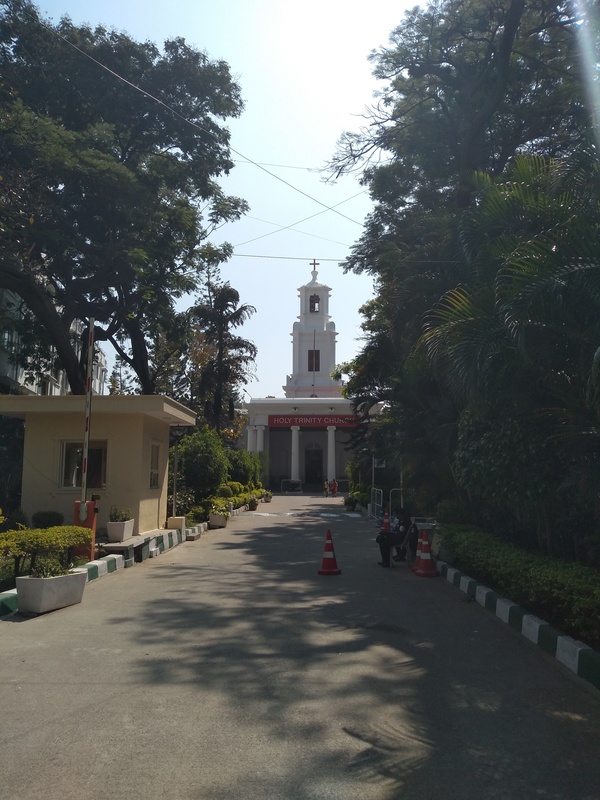 Before this stately building is the statue of Rev Ferdinand Kittel, a priest from Germany who had joined the Basel Mission and had come to Karnataka to spread Christianity. However he is remembered for his first Kannada to English dictionary compiled in 1894. He mingled with the locals, understanding their culture,language and his dictionary reflects this trait. The 1758 paged book covered more than 70000 words and often included commonplace or local words apart from the usual meanings and synonyms of words. 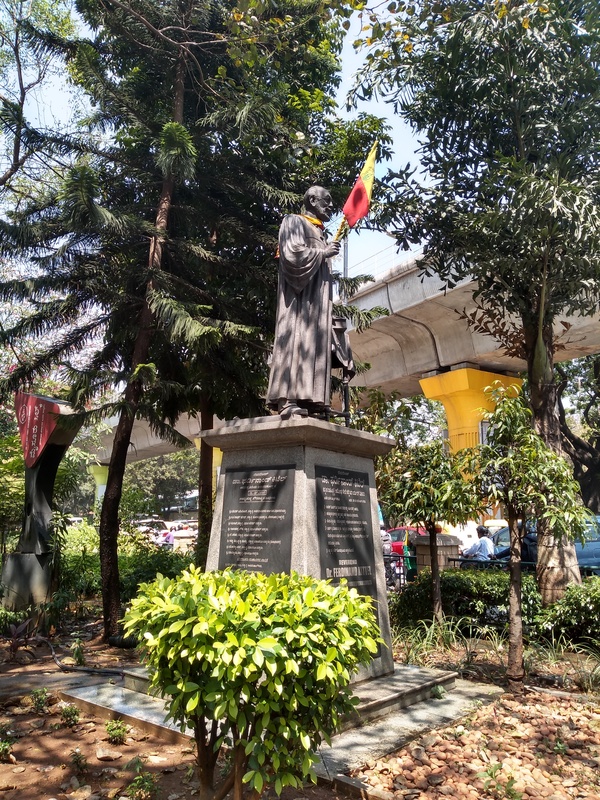 He is seen here holding a kannada flag. 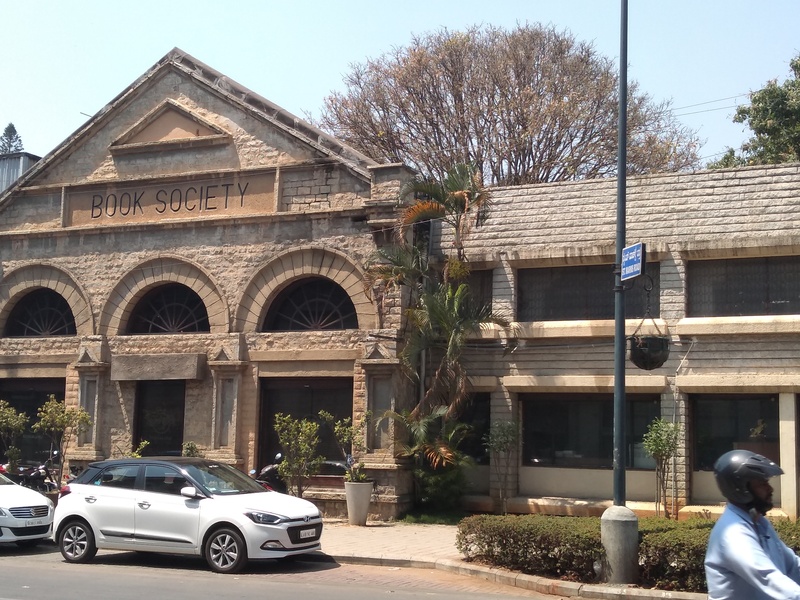 As you wind your way up and come towards MG Road-St Mark’s Road you hit the 1912 stone building of Bible Society and the Tract and Book Society . The Bible Society is responsible for printing and distributing Bible in different languages. Today it also prints literature books. Another section of the building facing the St Mark’s Road has the Hard Rock Cafe, that was a Tea room during the cantonment days, then went over to Tract and Book Society section and then to a music store, a pub and finally the Hard Rock Cafe. As you trudge ahead you sight the St Mark’s Cathedral and then the Queen Victoria Statue at Cubbon Park. The park served as the buffer zone for the old city and the cantonment. After nearly an hour’s walk you realize that there are a lot of hidden jewels in the city that the unplanned urban development has not been able to erase. And you wish to learn more. That’s when you must book a heritage walk with Unhurried and tag along for a slow heritage walk with us. Lepakshi is a wonderful weekend destination from Bangalore. Located in Anantapura district it is around 120 km from the city. There are plenty of intriguing things to see here.The hanging pillar, the red blotches on walls said to be bleeding eyes,the unfinished wedding hall, Lepakshi paintings with their colors still intact,the footsteps of Sita … Here is a quick summary of the attractions present at Lepakshi temple built during Vijayanagara times. The temple Lepakshi is on a plateau surrounded by granite rocks and boulders. The Lepakshi sculptors have thus used the abundant rocks to carve out huge monolithic sculptures that are one of the highlights of Lepakshi. 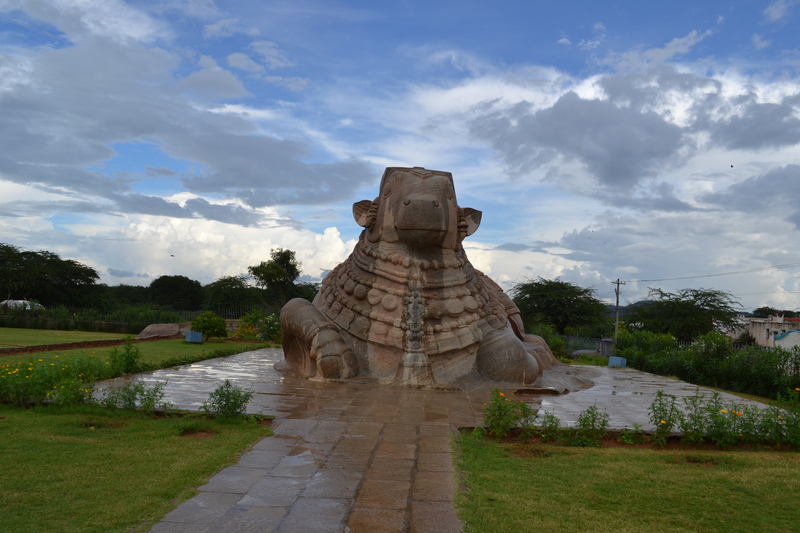 For instance the Nandi at the entrance of the temple is six feet high and eight meter long. 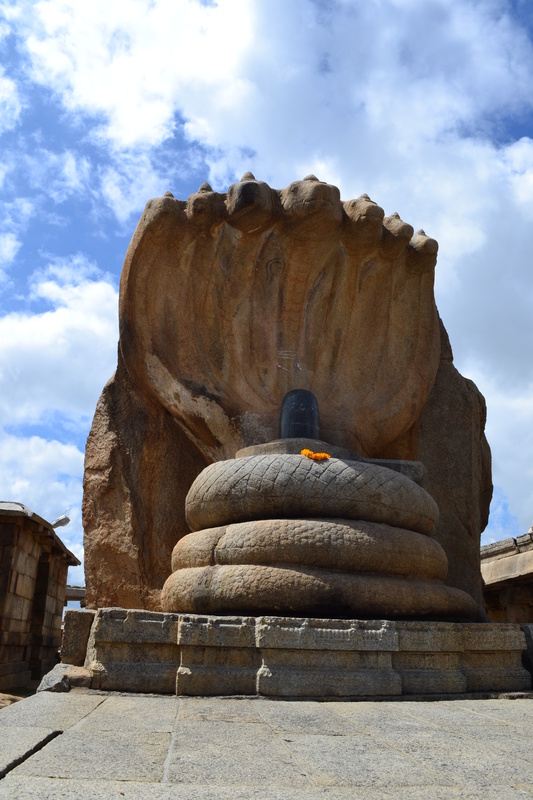 Inside the temple complex is another sculpture- a seven meter high Naga statue carved out from a boulder-the Linga however is a polished black stone. Behind the Linga you see carvings of spider,hunter and elephant worshiping the Linga- perhaps the legend of Srikalahasti itched here. On the walls of Virabhadra temple are some old Kannada inscriptions. 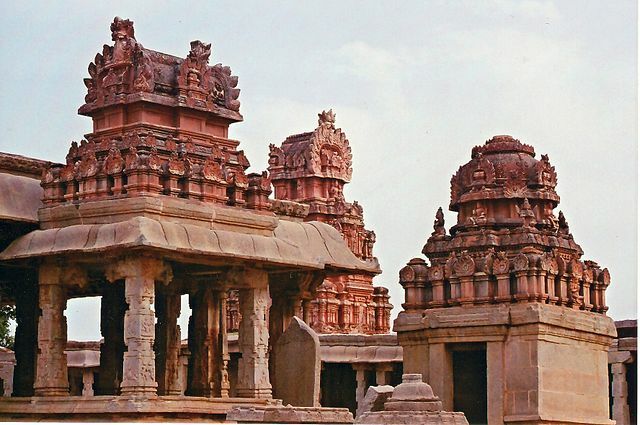 One of them is dated to the period 1531 and talk about the Vijayanagara king Achyutaraya giving grant of village to Virapanna, a governor of Penukonda for services of gods Virabhadra, Raghunatha and Papavinasa of Lepakshi. Virapanna’s reliefs and paintings inside the temple vouch to the fact that he played an an all important role in construction activities of the temple. How did Virapanna get the king to donate? George Michell in his lecture on Lepakshi mentions that Virapanna was from Veerashaiva community. During the Vijayanagara times they were involved in long distance trading and that perhaps explains their influence. Virabhadra was their patron deity. On the mandapa there are beautiful dancing figures-male and female both, exquisite yalis. The walls of Virabhadra shrine have two sets of carvings each going in the opposite direction. One tells the tale of Siriyala-one of the greatest devotees of Shiva who offered the cooked flesh of his only son to Shiva who had come disguised as a mendicant. In the opposite direction is the tale of Kirātārjunīya-the story of Arjun and Shiva disguised as Kirata. They both simultaneously strike a boar and end up fighting. Finally Arjun gets defeated and realizes whom he is fighting with and surrenders to Shiva. The paintings are a revelation. The ceilings of mantapas have paintings of Virapanna and his wife worshiping Virabhadra, story of Markandeya, Shiva as a wandering ascetic etc. The colors brown,black,deep red are still surviving and that’s what makes these masterpieces exciting. The Natya Mantapa or the dancing hall too has figurines of five headed Shiva,musicians,Bhringi -a sage with three legs etc. The ceilings too depict paintings like the story of Manu Needhi Chola- a king who killed his own son for the sake of justice to a mother cow whose calf was accidentally killed by Manu Needhi Chola’s son. Then there is the painting of Shiva as Bhairava with skull bowl and dancing deer. What makes this painting interesting is that in-spite of the frightful nature of Bhairava, the face of Shiva is calm. George Michell mentions that the fluidity found in these paintings is amazing. The later paintings after Lepakshi lack this aspect. The paintings also give a fair idea of the textiles and costumes present then. There are cotton prints with Kalamkari work on them, conical hats,dhoti, tops,sarees etc. giving a glimpse of society prevailing then. Apart from these attractions there is an unfinished mantapa known as the wedding hall with divine figures and sages sculpted on the columns; a hanging pillar that does not rest on the ground, the blotched red marks on the walls- said to be the plucked eyes of Virapanna who was charged with embezzling funds from the king’s treasury. Anger at being accused he blinded himself. The stories,the depth and details of paintings and relief figures will transport you to a different world. Lepakshi is a place worth visiting and makes for a good one day destination from the city. 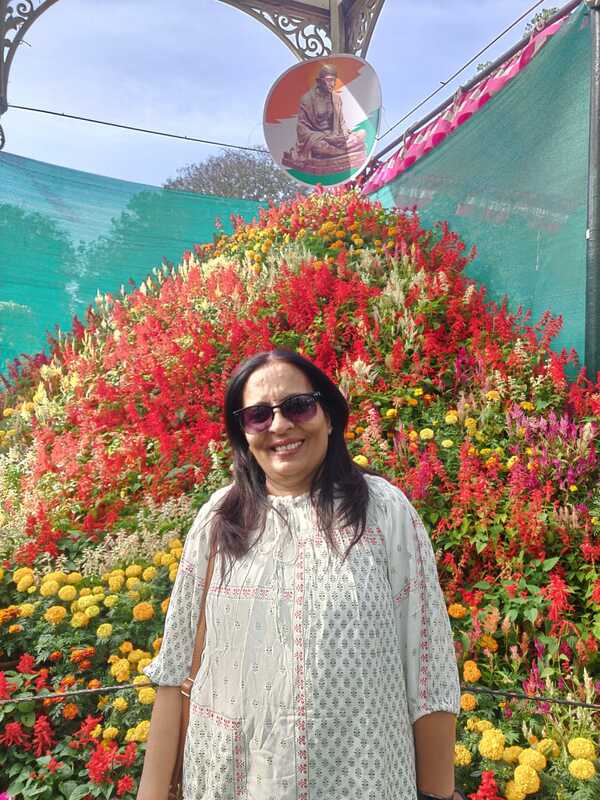 Don’t miss the republic day flower show at Lalbagh happening till the 26th of this month. With clear skies and warm sun it is a great time of the year to explore this 240 acre park. With colorful marigold,roses, chrysanthemums,lilies,hibiscus greeting you everywhere it is sheer joy to be present in this green space. 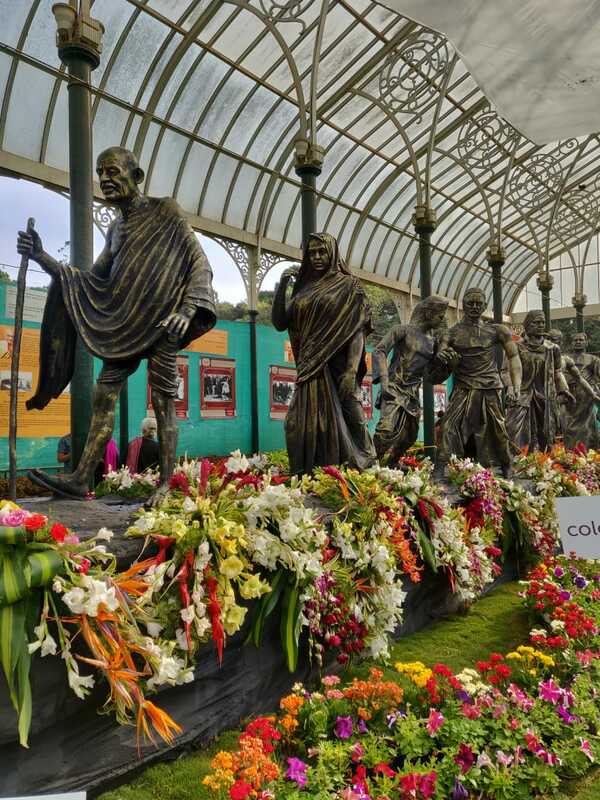 The theme of the 209th flower show this year is a tribute to Gandhi- in remembrance of his 150 birth anniversary. There is a 12 foot statue of meditating Gandhi, combined with his ashram, his glasses made of millet, Dandi March etc. The Sabarmati ashram at the center has been decorated with 2.4 lakh roses,3.2 lakh chrysanthemums and 80000 orange roses. There are also organic stalls,gardening section, stalls selling seeds and nurseries. Miniature garden models,composting and vertical gardens are certain highlights of the gardening section. 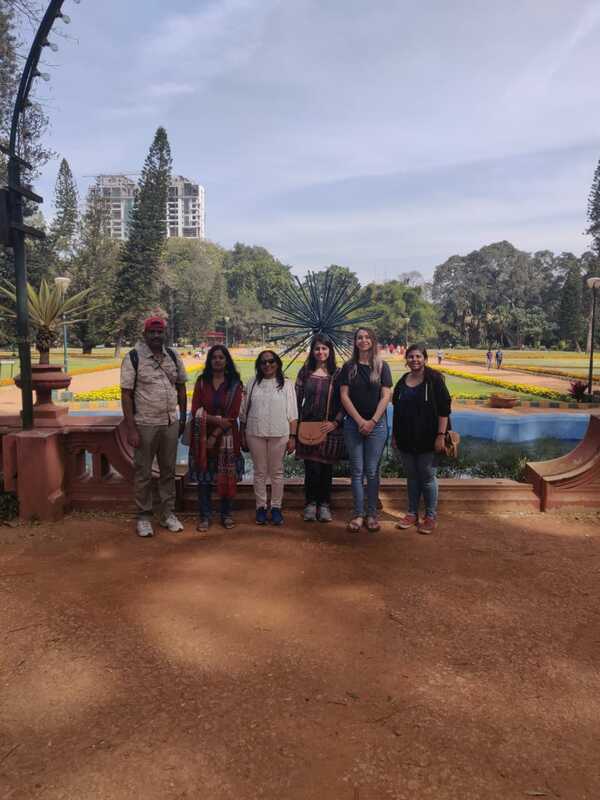 Here are a couple of snapshots from our Lalbagh Unhurried Walk that took place on the 20th of this month. If you are interested in joining our walks take a look at the walks and tours we provide. Abdur Razzaq was an ambassador sent to India by the Sultan of Persia- Shah Rukh. His narratives are rich and colorful and gives a detailed description of Vijayanagara times. However he was an unenthusiastic traveler. He did not like the sea and left Herat in 1442 only because of the Sultan. He faced the perils of sea, landed in Muscat for safety, reached Kariat and was seriously ill due to the heat and finally managed to recover enough to undergo 18 days of voyage at sea to finally land in Calicut. He was not impressed with the natives of Calicut either whom he describes as scantily clad and who practiced polyandry. His stay at Calicut was limited as the Vijayanagara King sent for him. And he passing through Mangalore,Belur reached Vijayanagara. Here however he is enthusiastic. He describes the city teeming with temples,gardens and palaces. Governed by an able king its territories extended from Ceylon to Gulbarga and from Bengal to Malabar. There were 300 harbors and 1,100000 warriors. The city was well fortified and its markets were teeming with wealth. He describes the Royal Center of Hampi and mentions that several rivulets and streams flowed through channels of cut stone. When he met the Raja – Deva Raya II he describes him sitting in a forty pillared hall surrounded by Brahmans. And goes on to add that the king had an olive complexion and wore a collar of king pearls. He was rather tall and youthful with no hint of beard or mustache. On meeting the king, he was given a Chinese fan and money,camphor and betel. His accommodation was at high ground near the King’s palace and he was daily sent two sheep,four couple of fowls,rice,butter and two gold varahas. It was during his stay that the incident between the king and his brother occurred. The king’s brother had constructed a new palace and invited the king and other nobles to a feast. The guests were made to sit in a large hall. There were drums,trumpets and horns on the occasion. From time to time the guests were invited to check out the banquet and celebrations. As each guest came out he was ambushed and swiftly murdered and when all the victims were killed, the brother then went to the Deva Raya’s palace and approached him with tray of betel in which a dagger was concealed. He managed to wound the king and leaving his accomplice to kill the king,he declared to the court that he was the king. Though Deva Raya was wounded he manged to kill the accomplice and reappeared in the court. The crowd seeing the rightful king alive murdered the tyrant brother. Hearing this news the ruler of Gulbarga-Allauddin Ahmad Shah ordered the Vijayanagara King to pay 700000 gold varahas. He assumed the wounded king would be very weak and unable to defend himself. The king however laughed at this and went to war with the Bahmani Sultan. This was in 1443-1444 and he managed to conquer Raichur,went till Bijapur and overtook the fortress of Mudkal. However the war resulted in a truce and the Vijayanagara forces were forced to retreat and driven back to Mudkal. And what of Abdur Razzak? He set out from Vijayanagar on November 1443. Rumors had spread around him that he was not a bonafide envoy of Shah Rukh and so he left the city, reached Mangalore after 18 days, then went on to Kalahat,Muscat,Khurfakan and finally to the port of Hurmuz. He was in sea for a total of seventy five days. And after this never ventured out to travel again. Last year the Krumbiegel hall was demolished. It was a lecture hall used by Gustav Hermann Krumbiegel, the eminent superintendent of Lalbagh. The handsome colonial building that was witness to numerous lectures and session on gardening and Botany was razed to the ground. Though the 100 year old structure was a heritage building, yet it was pulled down- No laws to protect it you see. 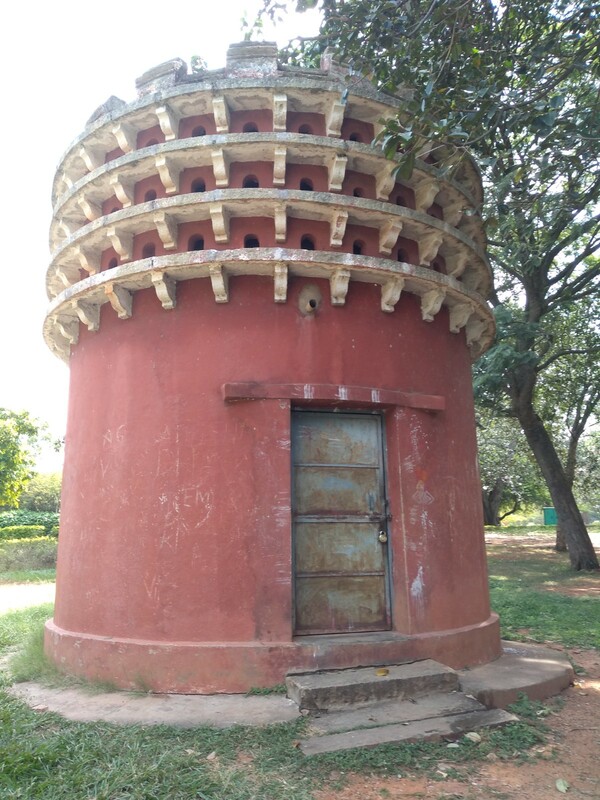 However Lalbagh is dotted with plenty of such structures. Before they too bite the dust here is a brief overview of some of them. 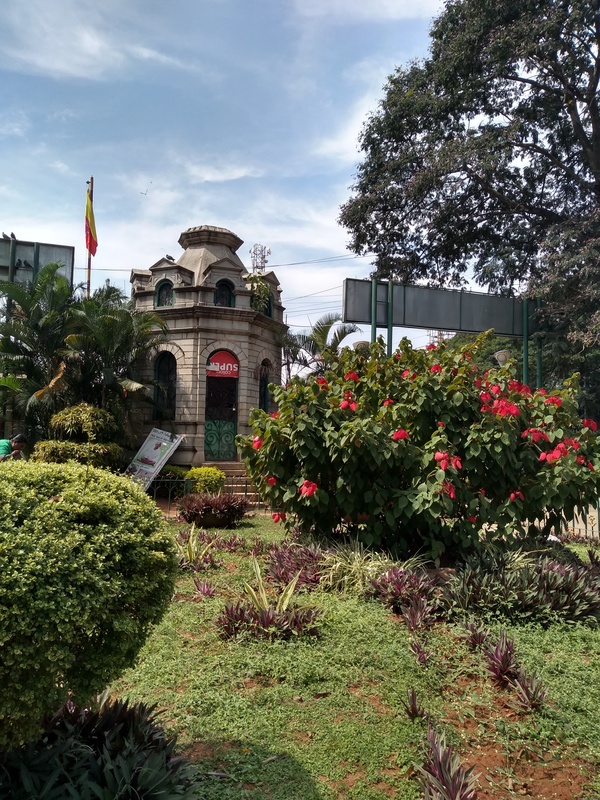 This structure near Siddapura Gate of Lalbagh is a structure of 1893 constructed during the time of John Cameron. The cylindrical shaped structure, 15 feet high has holes all around it for pigeons. Around 100 pairs of pigeons can dwell here. The Pigeon House also has a watchman’s quarters within. This beautiful guard room near the West Gate of Lalbagh was once part of Diwan P.N Krishnamurthy’s House. When his house was getting dismantled the then Director of Horticulture- H.C Jayaraya got it here sometime in 1940’s. The granite structure, shaped like a lantern with glass windows all around it, is beautiful sight when lit. It glows like a lantern in the dark. This building was constructed in 1920 when G.H Krumbiegel was the Superintendent of Lalbagh. He wanted to set up a college of Horticulture here with a library,museum,lecture rooms etc. This dream however did not come true. Today the building contains the offices of Directorate of Horticulture. This colonial building was the house of Superintendent of Garden. The structure exists from 1839. When Lalbagh was under the Agricultural Horticultural society, secretary William Munro mentions expenses incurred for construction of a house for Superintendent of Lalbagh. This structure had a number of rooms like drawing room,store rooms,halls etc. 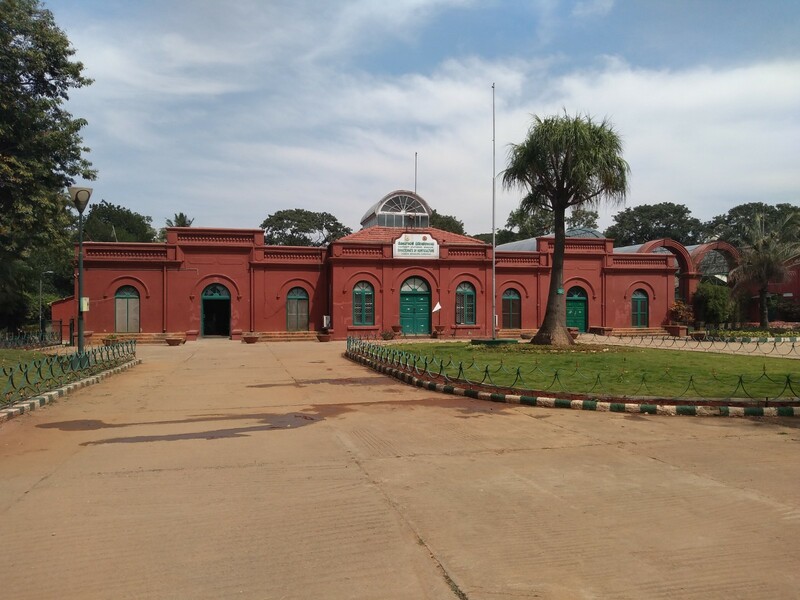 Today it houses the Lalbagh Library. The Glass House, Band Stand, Aquarium building, Deer Paddock are other structures. The Deer Paddock was a tiled free standing structure that once sheltered deer. The Band Stand once used to hold flower shows before the construction of Glass House. The Victorian styled Band stand existed prior to 1870. The Glass House got constructed during the times of John Cameron and its foundation stone was laid by Prince of Wales in 1889. The construction was done by MacFarlane and Company, Glasgow. 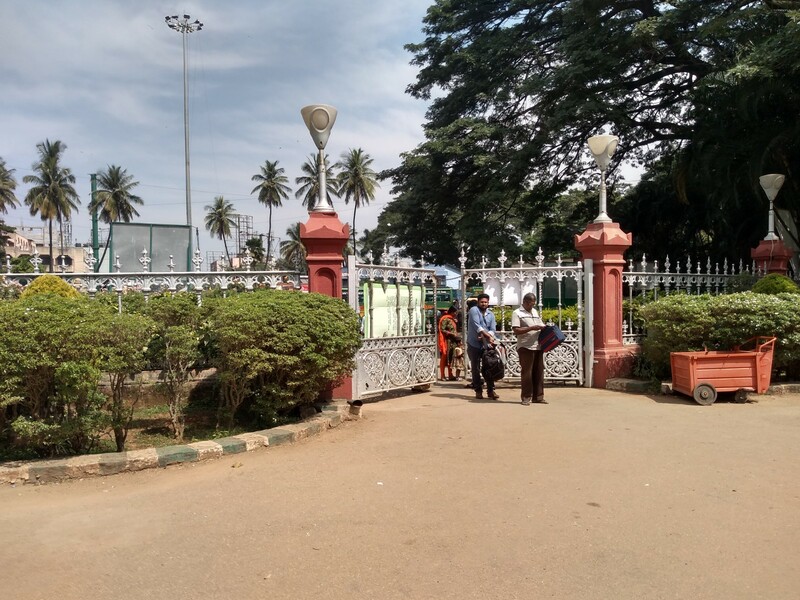 They were also responsible for designing the Cameron Gate of Lalbagh sometime in 1891. 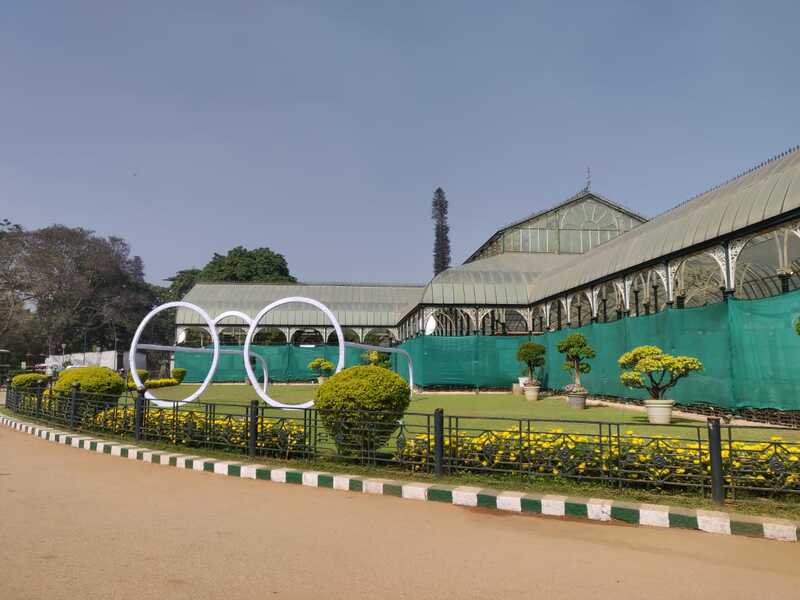 The next time you visit Lalbagh do spare these heritage structures a glance. They form a valuable part of history. 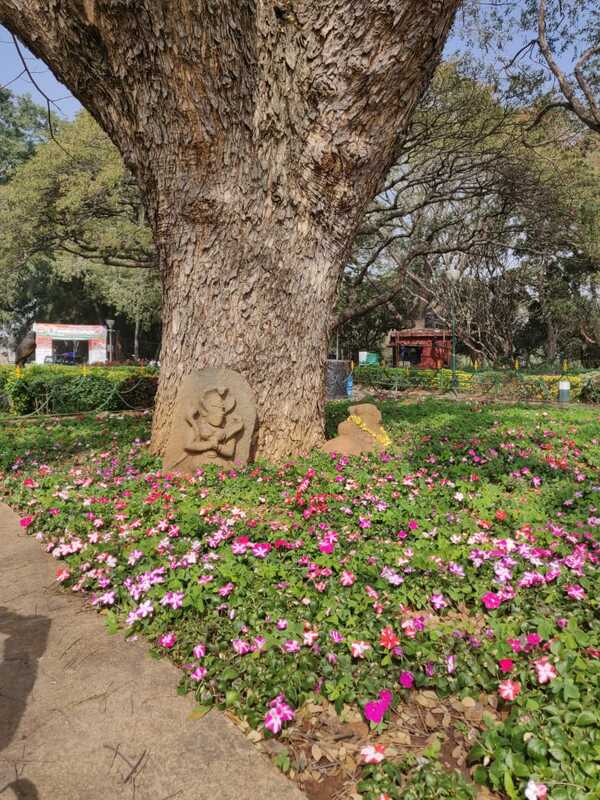 Do join our Lalbagh Walks if you wish to know more. The bugle rock of Basavangudi is a scenic place filled with dense groves of trees , a 1.8 km cobbled stone path for walking and lovely stone benches for the occasional rest for the tired walkers. Inside the park is an old water tank- the outer walls have been re-purposed with murals of famous personalities of Karnataka. And in one of them stands Masti Venkatesha Iyengar, a prolific Kannada writer- recipient of the famous Jnanapita award. I knew nothing much about him, save this. So a bit of research – the google and a couple of books about Masti and I discovered a disciplined, honest, an able administrator not to mention a man with a creative streak in him that made him author 123 Kannada and 17 English books. Here are few tidbits about him. Known for his short stories he was honored with the title Rajasevasakta. With more than 123 books under his belt, a D.Lit of both Karnataka and Mysore universities and prior to that District Commissioner of the State, you would think life would have been a smooth journey for him. But it was not so. In fact he suffered hardships throughout his childhood and growing up years. He was born on June 6, 1891 in Kolar in a small village known as Masti. 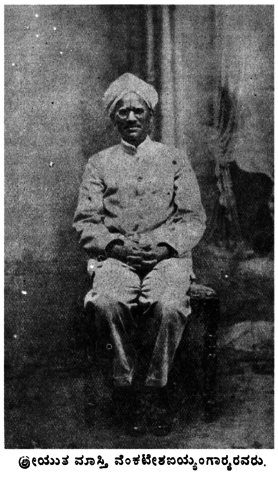 Son of Ramaswami Iyengar and Tirumallama, he was born in to a rich family. But the family suffered hard times, lost their land. Masti had to bear all this. The plague too had stuck by then. So Masti shifted from his village with his grandfather and moved to Hongenhalli village. His father and brother lost their lives due to plague. Masti had to shift homes,schools. He did his BA from Central College, Bangalore. After that he did his MA in English at Chennai. No matter where he studied, he always managed to stand first. In Madras too he was a gold medalist and topped his MA. For some time he worked at the Presidency College of Madras before sitting for the civil services exam at Mysore. And in 1914 he joined government services as Assistant Commissioner and soon rose to become the District Commissioner. However he was bypassed for the post of Minister and a junior got promoted instead of him. For this reason he resigned from the services in 1943. Masti’s writing journey began in earnest after this though his first short story was published way back in 1914. Masti wrote under the pen name Srinivasa and when he started out he wanted to write in English. But an encounter with a farmer changed this. During his tax collection rounds when Masti berated a farmer for not paying his dues, the farmer mentioned that he did not know the rules that were all written in English. This prompted Masti to shift to Kannada. His first story was Rangana Maduve and his last was in 1985 and was titled Maatugara Malanna. During his lifetime he wrote essays, short stories, novels, dramas, poems and social stories. His novel Chikkaveera Rajendra won the Jnanapita award in 1983. His love for Kannada was tremendous. He headed the Kannada Sahitya Parishat and in 1929 headed the Belgavi Kannada Sahitya movement. It is said that he always addressed his talks in Kannada. Masti died in June 6,1986 at the age of 95. The only memories of him today is the Masti Mane in Gavipuram that has been converted as the office of Masti Venkatesha Jeevana Kaaryalaya[MVJK] Trust. The Trust has preserved Masti’s books and his letters. The road where his 90 plus years home stands has also been named as Masti Venkatesha Iyengar as a tribute to the fourth Jnanapita award of the State.